The Fog Comes on Little Cat Feet. Photo by Tom Doyle. Tom Doyle took this photo at Goose Pond on Kenridge Farm on a late afternoon in December. 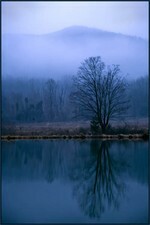 He writes: "I framed the tree and its reflection and waited as the mountain in the background appeared and disappeared in the mist."